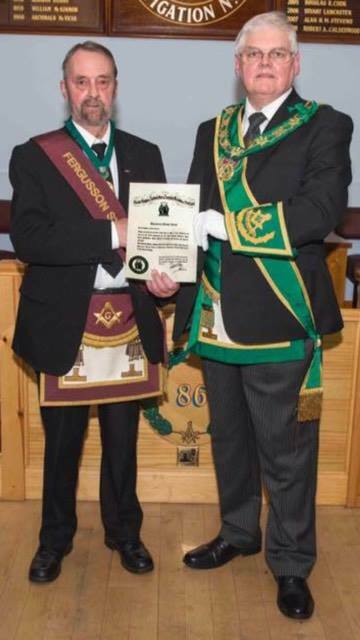 On Thursday 19th February 2015, Right Worshipful Provincial Grand Master of Ayrshire Robert Little was made an Honorary Member by RWM David Wason. On 3rd April, RW PGM Robert Little headed a deputation into Lodge Ferguson St. James No. 566. After the business was completed, a 3rd degree was conferred on Bro. Peter J. Ogg (PM of Maybole No. 11 and Honorary member of 566) this was the 100th time that Peter had acted as candidate in Lodge Ferguson St. James. RW PGM Robert Little presented Bro. Peter with a certificate to mark the event and a Thank You card from the Lodge, RWM Tom Hainey added his remarks and thanked Bro. Ogg for all his hard work (Peter is also the “cook” for the harmonies). Bro. John Kirkpatrick WSW Lodge 'The Bonnie Doon' No. 565 receiving Honorary Membership from RWM Bro. Thomas Hainey. 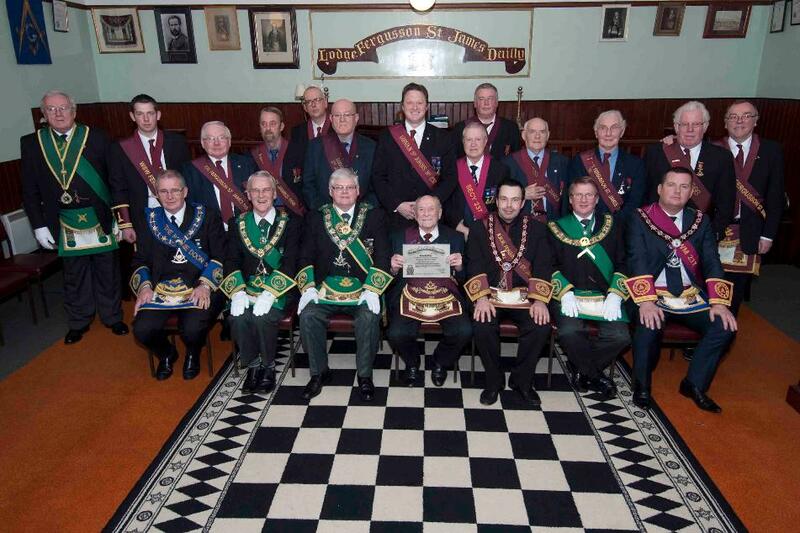 On 16th January 2014 the RWM and brethren of our Lodge conferred an EA degree on Bro. Jamie Boyd. On 19 December RWPGM Bro. 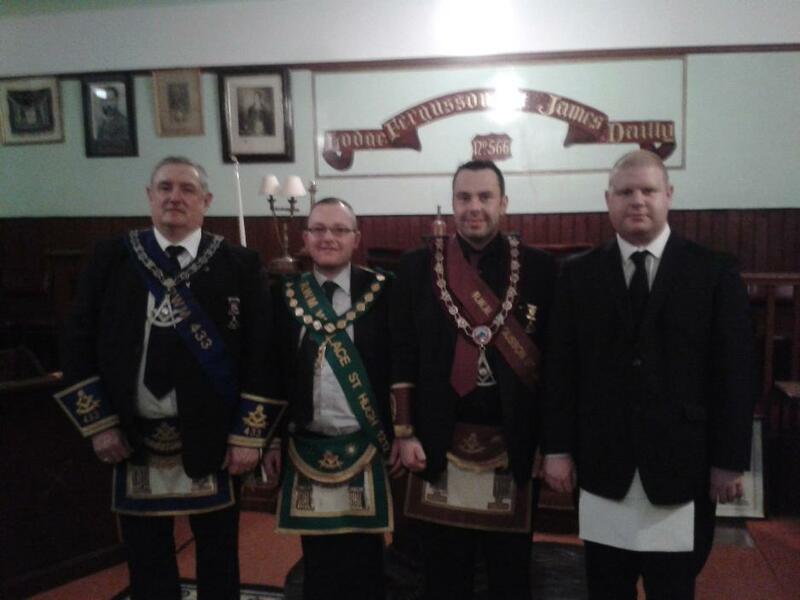 Robert Little visited Lodge Fergusson St. James No.566 where he was warmly greeted by the RWM Bro. Tom Hainey. The Brethren of 566 conferred a MM degree after which the RWM wished all Brethren the compliments of the season. Amongst the many visitors was Bro. Pete Hylton of Brownsburg Lodge No. 241 Indiana, USA. Bro. Pete presented the RWM with a token from his Lodge. RWM Bro. 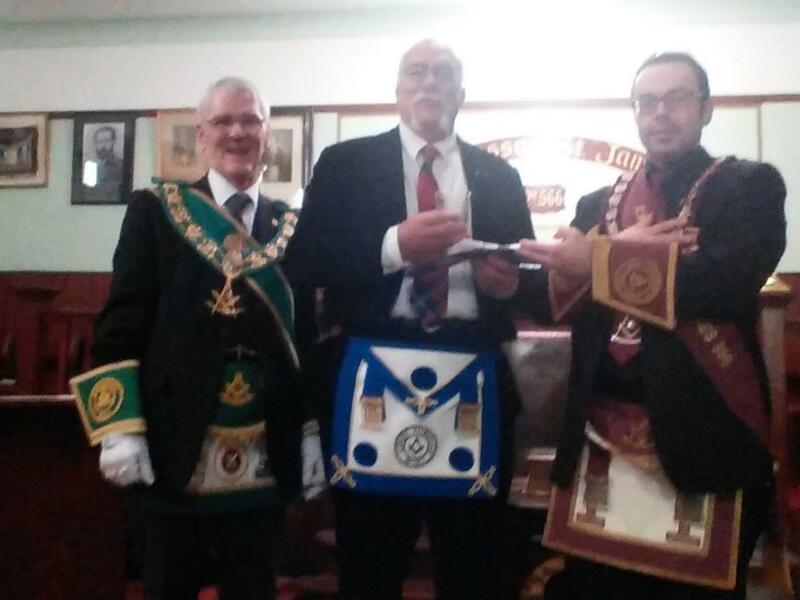 Tom reciprocated with a Mark token, Lodge tie and glass on behalf of the Brethren of 566. 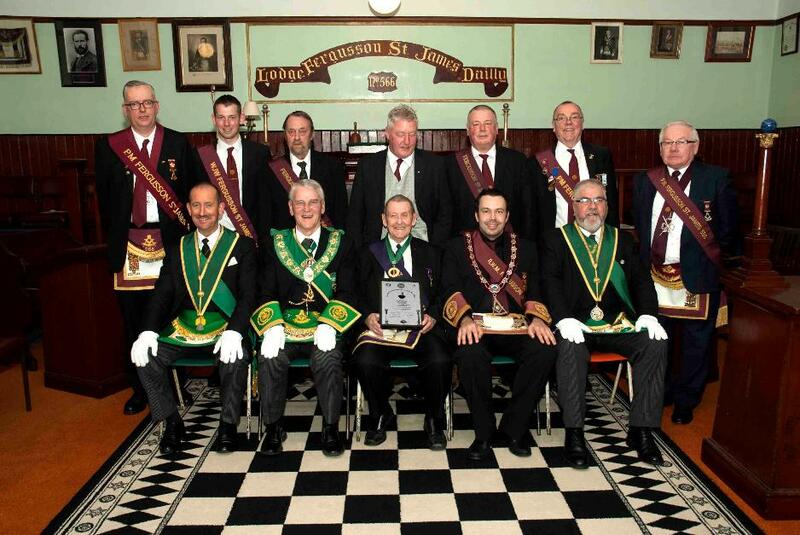 On 17th January 2013 RW PGM Archibald Chalmers headed a deputation from PGLA into Lodge Ferguson St. James No. 566. 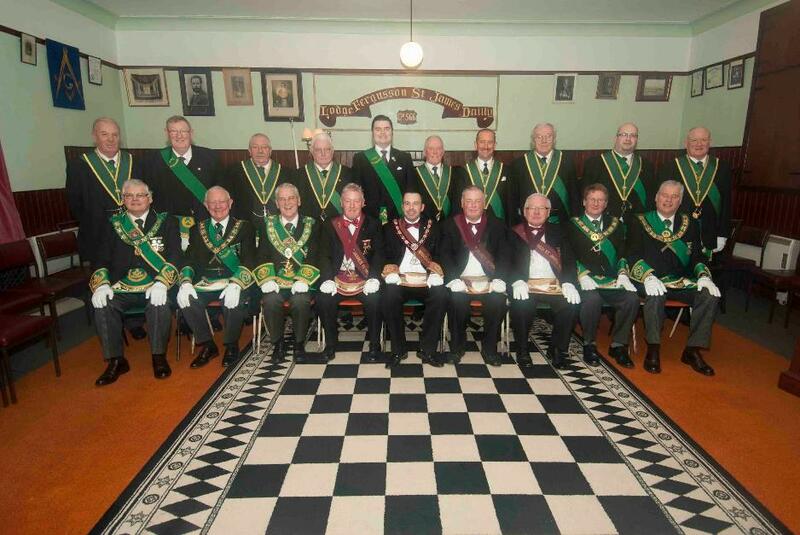 RWM Thomas Hainey welcomed the deputation and after the business conferred a 3rd degree assisted by his Office Bearers. At the completion of the degree, with DPGM Robert Little acting as PGWSW and SPGM William Steel acting as PGWJW, PG DoC Stuart Muirhead, RW PGM Archibald Chalmers presented PM Brodie Gibson with a 50 year Jubilee Certificate.